For inside and outside installation, to receive lint, buttons and other waste coming from clothes washers and commercial laundromats. Our simple design is a perfect application of the principle of nature’s own law of gravity in separating lighter-thanwater wastes from heavier-than-water matter. These light-density lint substances, as well as buttons and other waste coming from clothes washers, are retained in the Rockford Separator. Note the course of water travel in cut-open view. The arrows designate the course waste water enters inlet, passing through the primary filter and on thru the secondary filter and then the flow is directed downward to outlet opening, up through the outside visible trap, and finally through the horizontal opening in outlet tee to the drainage system. There is no straight in-and-out travel from the inlet to the outlet of the separator. For continuous or severe operation, consult our Engineering Department. The RLS Series Separator is built of all-welded heavy-duty steel plate for maximum strength and durability. Both the interior and exterior are coated to resist acid corrosion. These units have removable covers for on-the-floor, partially recessed or flush-withfloor installation, suitable for pedestrian traffic or reinforced for heavy traffic. The cover is secured to the body with recessed stainless steel bolts and includes an extra-heavy leakproof gasket. Separating screens and a flow-regulator filter screen regulate flow and filter waste water, making outside flow control or retarder unnecessary. The outlet is separated from the main body of the unit, meeting all plumbing code requirements of an outside visible trap seal. All units are available in double-wall construction with leak detection if specified. Cor-Ten® high-strength, low carbon steel with its high strength and outstanding resistance to atmospheric corrosion is available where maintenance cost savings are prime considerations. Even in an unpainted condition, Cor-Ten® has a tightly adherent oxide surface which stops further oxidation. Painted or coated, this characteristic is further enhanced. The reliability and strength of this material has been proven in many applications, such as railroad cars, bridges and two of the tallest buildings in the world: the John Hancock Building and the Sears Tower in Chicago. Visible double-wall outside trap seal with vent connection prevents siphoning. 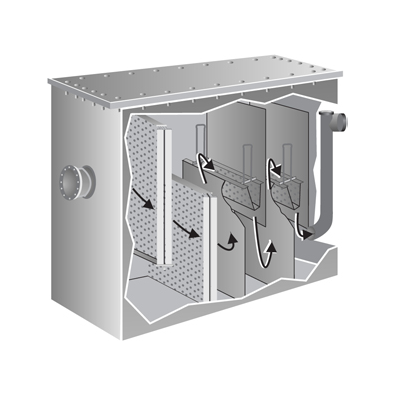 Separate internal vent connection keeps pressure from building up inside the unit and from forcing contents into the drainage system through the vent; also releases any fumes which may build up inside the unit. To combat suds blow up, contact our Engineering Department. There is no straight in and out travel from inlet to outlet. Waste water enters inlet, passing through the primary filter and on thru the secondary filter and then the flow is directed downward to outlet opening, up through the outside visible trap, and finally through the horizontal opening in outlet tee to the drainage system. The number of filters will vary depending on the size of the unit. When the primary filter becomes clogged the flow is directed downward and to the next filter. This process continues until the final filter becomes clogged. When this occurs the flow through the separator will slow down and eventually shut off. Slow down of the flow is an indication that the filters need cleaning and/or replacing.